27-23 LSU: LSU wins 27-23 over Auburn after being down 20-0. Both the offense and defense come alive and LSU takes a knee to knock off the tenth-ranked Auburn team. 27-23 LSU: A huge fourth down stop sets LSU up with good field position and they take advantage, getting another field goal to force Auburn to score a touchdown with just under 40 seconds remaining in the game. 24-23 LSU: The home team Tigers finally lead here in Death Valley after a successful 42-yard field goal from Ed Orgeron's squad to send the Baton Rouge crowd into a raucous fever with two minutes remaining in the game. 23-21 Auburn: A massive, game-changing punt return touchdown from LSU's DJ Chark sprints 75-yards to bring the game to just a two-point lead for Auburn after a successful PAT. That concludes the first half here from Tiger Stadium with Auburn leading LSU 23-13 in Baton Rouge. 23-13 Auburn: A clutch drive from LSU quarterback Danny Etling as he lays out an inch-perfect touchdown pass to Russell Gage before a successful PAT keeps the margin to nine points. 23-7 Auburn: Another methodical drive down the field from Malzahn's offense and another field goal for the tenth-ranked Tigers after LSU's Greedy Williams saves a touchdown pass on third down. 20-7 Auburn: A huge play from LSU's DJ Chark to get into the redzone and a clutch fourth down touchdown run gets the Bayou Bengals on the board here in Death Valley. 20-0 Auburn: Another field goal just flies in and its now a 20-point lead in the first half here in Baton Rouge. 17-0 Auburn: Another huge play on offense from the tenth-ranked Tigers as a sneaky wildcat play in the redzone helps Malzahn's squad to a dominant lead here in the first quarter. 10-0 Auburn: After a fumble on a big reception from LSU, Auburn takes advantage and a deep Jared Stiddham pass gives the Tigers from Alabama a 10-0 lead early in the first half. 3-0 Auburn: A strong offensive start from Auburn and some good fortune for Gus Malzahn's team as a field goal bounces off the goalpost and in for an early lead. The kick is off and this SEC West matchup is underway here at Death Valley. LSU won the toss and elected to differ. Auburn will receive the ball first. Auburn and LSU have taken the field here at Tiger Stadium in Baton Rouge. 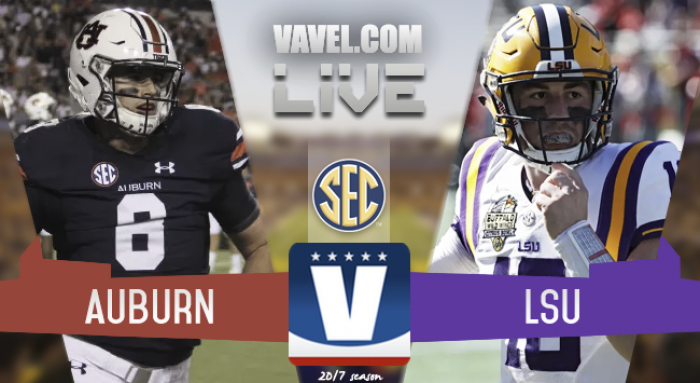 In a few moments, we will share the initial lineups of Auburn Tigers vs LSU Tigers live score, in addition to the latest information that surges from the Tigres Stadium. Do not miss a detail of the game with the live updates and commentaries on VAVEL. Overall, despite LSU's struggles of late, the Louisiana Tigers still possess the talent and play-calling ability to contend with Auburn and expect a close game deep in the fourth quarter. Ultimately, if Auburn and LSU can play their normal level on defense, then this game will most definitely come down to the offense. 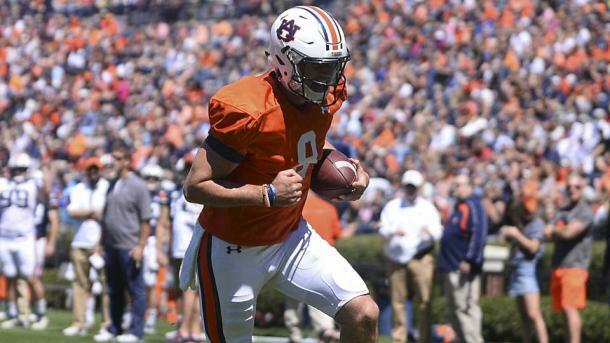 Auburn posses the far superior quarterback in Jarrett Stidham, giving them a significant advantage if the game goes deep into the fourth quarter. While Auburn has fully hit their stride the last three weeks, its been a much greater struggle for the unranked Tigers of LSU. 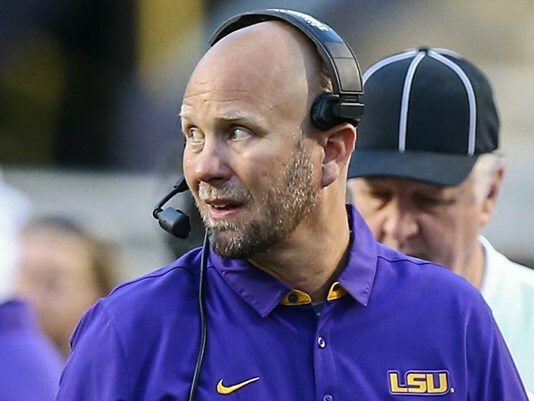 While Ed Orgeron's squad did claim their biggest win of the season so far last week over rival Florida, the offense led by Matt Canada is still yet to fully get going, with only 73 points in the last three weeks, nearly half the points Auburn has amassed in that same time period. The Bayou Bengals need a big division win to keep their hopes alive, and a strong home-field advantage could help them obtain that. For Auburn, Gus Malzahn's team comes into Baton Rouge high on confidence, with a staggering 144 points scored by the Tigers the last three weeks. Despite their tight loss to Clemson in week two, Malzahn's squad sits at ten in the AP poll with just one loss and legitimate division title hopes. This matchup between Auburn and LSU has been influential in both teams' seasons the last decade, with each year Auburn or LSU has won a national championship, the winning team between the Tigers went on to win the trophy. While LSU only leads 4-3 since 2010, Auburn will be desperate to end their Death Valley struggles, having not won on the road at LSU since 1999, nearly 20 years ago. While Auburn comes into this big game against LSU ranked tenth and the Tigers from Louisiana head home after edging past Florida to win their biggest game of the season so far, it'd be hard to overlook this compelling SEC West matchup. Given Auburn's impressive one-loss season so far and the proficiency on offense the last three weeks, the Tigers from the plains come into Baton Rouge in a good place and a current touchdown favorite over the home Bayou Bengals. After an intriguing and influential first six weeks of the college football season, week seven is upon us and with that comes the gauntlet of division games for most teams. This couldn't be any truer than in the SEC, where there are five big conference games with major implications on the chase for Atlanta and the SEC Championship game. Welcome to live coverage of the SEC Football! My name is Thomas Cluck, and I am happy to be bringing you play-by-play coverage of Auburn vs. LSU here on VAVEL. From now until the game begins at 3:30 pm ET, news, and notes will be above to get you up to speed. Be sure to return before game time for play-by-play updates!